Much like the Garth Ennis comic book that inspired it, AMC’s “Preacher,” premiering this Sunday night, May 22nd, has its own rhythm and yet also feels indebted to great works of fiction that came before. It has echoes of AMC hit “The Walking Dead” and also regularly reminded me of Joss Whedon’s shows “Buffy the Vampire Slayer” and “Angel"—programs in which the supernatural world, and its connection to our own, didn't make just for action gimmicks, but essential characters. “Preacher” is a dark, funny and strange show, in the best way possible. It regularly turns when you expect it to go straight and stops dead for character when you expect an action sequence. It takes a few episodes to get into its rhythm—and it’s one of the few shows that might have been better served by a Netflix-like binge format—but it eventually becomes thematically dense without losing its ability to entertain. As we should expect from co-creator Sam Catlin, one of the people behind “Breaking Bad,” “Preacher” is the kind of show in which actions have consequences that could mean the end of the world. In many ways, it’s “Angel” meets “Breaking Bad,” and who wouldn’t want to watch that? Clearly, I’m something of a fish in this television barrel. I love stories about men who go looking for God and end up finding the Devil, and place that kind of Heaven-and-Hell narrative in the brutal Texas sun. The pilot, directed by co-creators Seth Rogen & Evan Goldberg, features music by Lucinda Williams, Willie Nelson, and Johnny Cash; a vampire who jumps from a burning plane; a fist-throwing preacher and much more that I wouldn’t dare reveal here. 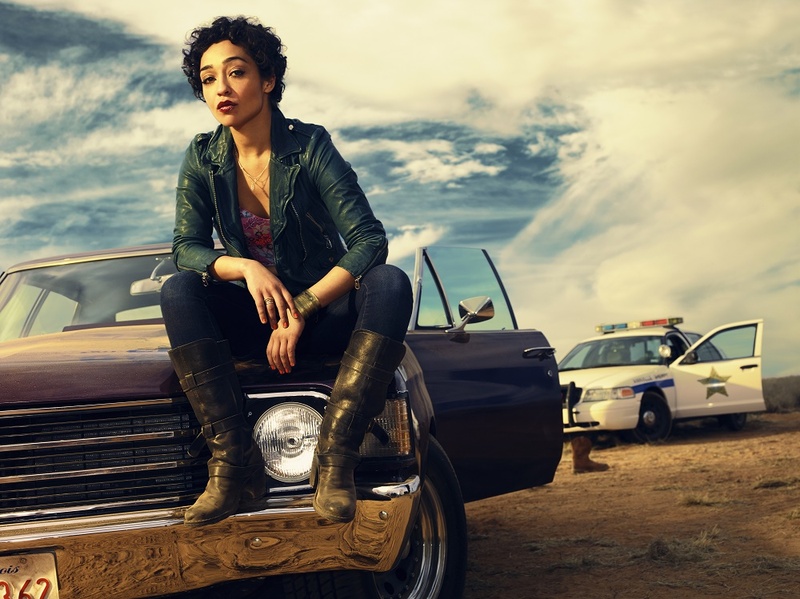 And yet “Preacher” transcends the undeniable charms of its set-up through clever writing and plotting, carried by fantastic performances across the board. Not every one of its attempts at “something different” works, but I’ve seen four episodes and I am completely, unapologetically hooked. “Preacher” sets its WTF tone immediately. We watch some undefined force speed its way through outer space and blast into an African preacher. The preacher says “I am the chosen one” and immediately explodes, showering his parishioners in blood. As they run screaming from the church, the cross outside falls as the title comes up. One part Whedon, one part Raimi, one part something totally new, “Preacher” isn’t for everyone, certainly not for the overly devout. But its playfulness in the way it combines religious mythology with southern-fried drama is captivating. Dominic Cooper (“An Education”) plays the title character, Jesse Custer, a former criminal trying to take the righteous path as a small-town preacher. The great W. Earl Brown (“Deadwood”) plays the Sheriff and Lucy Griffiths is Emily, the sweet girl who works for and looks up to Custer. Even if “Preacher” was just a show about a man trying to keep his dark side at bay by preaching the word of the Lord, there would be enough there to make it interesting. It’s telling that the creators are careful not to lose the very human foundation of their narrative, even when they introduce "Preacher'"s scene-stealers: a former lover and criminal partner of Jesse’s who calls herself Tulip (Ruth Negga) and an Irish vampire named Cassidy (Joseph Giligun), who might remind everyone of a certain age of “Buffy”’s Spike with his hard-living and high difficulty to kill. In his introduction, he takes out a plane full of vampire hunters, jumping to the ground without a parachute. He finds that he landed in the small town of Annville, where Jesse is the preacher, and becomes his moral support and handyman. “Preacher” is full of memorable supporting characters, including the two nearly silent enforcers coming after either Cassidy or Jesse (it’s not clear at first), a teenager named Arseface (Ian Colletti) who tried to blow his face off with a shotgun and now has a hole where his face should be and a nefarious businessman played by the simply-perfect Jackie Earle Haley. Despite deviating from it tonally and narratively, what “Preacher” shares with its source material is that willingness to be different. It doesn’t feel quite like anything else on television right now, never taking itself as straight-faced seriously as “The Walking Dead," displaying Rogen & Goldberg’s willingness to take weird chances. As the show establishes its identity, the first episode has to introduce a lot of characters and one can sometimes feel the strain from the co-directors. However, the second episode (directed by Michael Slovis) is instantly more confident and refined. The actors look more comfortable in their roles, particularly Negga and Giligun, and the writing is tighter. The dialogue is smart, the plotting is creative and the characters are fascinating. 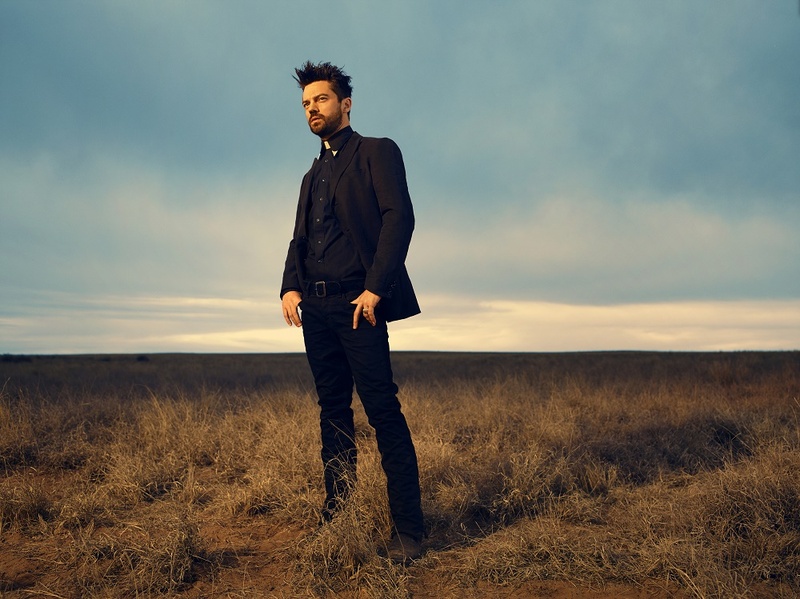 And then Johnny Cash’s cover of Soundgarden’s “Rusty Cage” kicks in, and I realize I may have never been the target audience for a show more directly than I am for “Preacher.” I believe.